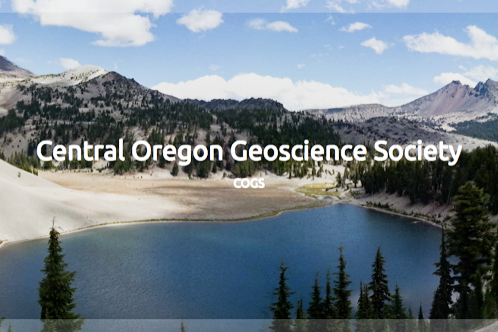 After a few intro slides showcasing Oregon’s beautiful and diverse landscapes, Miller approached the geology of Oregon in three different ways: descriptions of the geological provinces of Oregon, roadside geology tours along specific highways, and a chronology of events in Oregon’s geologic history. These approaches are also reflected in the book’s organization, with the chronological history given in the introduction, then the roadside tours being grouped according to the geological province in which they occur. Also in the introduction of the book is a discussion of plate tectonics, which is the basis of modern geologic concepts. Miller mentioned that the movements and boundaries of the North American, Juan de Fuca, and Pacific Plates form the environment in which the geology of Oregon occurs. The subduction of the Juan de Fuca Plate under the North American Plate provides material which forms an active chain of volcanoes and also intrusive bodies such as those found in the Wallowa Mountains. In addition to the volcanism, landscapes are formed as material carried by the oceanic plates is accreted to the margin of the North American continent. The large accreted terranes in Oregon are the Wallowa, Franciscan and Siletzia Terranes. The most recent of these terranes, Siletzia underlies the Coast Range geologic province of Oregon. Siletzia formed in an oceanic environment and accreted onto North America about 54 million years ago. The Coast Range consists largely of sandstone sedimentary formations sitting atop oceanic basaltic of the Siletzia terrane. The sandstone consists of the Umpqua and Tyee formations, which represent sediments from before and after terrane accretion, respectively. The headlands north of Florence are made out of Columbia River Basalt Group (CRBG) basalts, which flowed through the Cascade Range in the Miocene and cut through some of the coastal rock layers to erupt and cool in the ocean. The Cascade Mountains geologic province is divided chronologically into the Western Cascades and High Cascades. The older, eroded Western Cascades are now the foothills for the more recent High Cascades. Both mountain ranges are volcanoes of andesite, basalt, lahar, and ashfall sequences of material produced by the action of oceanic subduction of the Juan de Fuca Plate. The Lava Plateaus geologic province surrounds the Blue Mountains, and is bounded to the west by the High Cascades and to the south by the Basin and Range province. The Lava Plateaus are relatively flat terrain which has been inundated repeatedly by sequences of Columbia River Basalt Group floods from 17-6 million years ago, ashflow tuffs such as the Rattlesnake Tuff of 7 million years ago, and similar volcanic events. The Basin and Range geologic province covers the southeastern part of the state, extending south through most of Nevada. It consists of blocks of land which have been slowly pulled apart by the action of crustal extension, so there are abrupt edge displacements between blocks which may be thousands of feet high. The Blue Mountains geologic province may be the most variable terrain in the state. It consists of the oldest accreted terranes plus intrusive batholith and stitching plutons. Not only that, but the CRBG originated in sheet dikes in this province which cut through the older rock sequences. After this broad tour of the state through the descriptions of the geological provinces, Miller then toured the state using some key examples of highway routes from the book starting with US 197 from the Dalles to the junction of US 97 south of Maupin. The stratigraphy of this area starts with the youngest and topmost Dalles Group strata (also called the Deschutes Formation in the Bend area), consisting of material eroded from the early High Cascades volcanoes. Below the Dalles Group lies the CRBG, which is considerable. Miller showed the audience a slide showing the Maupin setting and all the exposed landscape is CRBG. The John Day National Monument lies on the route and showcase the John Day and Clarno Formations from the Oligocene and Eocene. These formations record a gradual climatic change from tropical to subtropical, from 48 to about 38 million years ago. Miller spoke at length about the Wallowa Mountains and the Wallowa Terrane, as seen from traveling the Oregon 82 and Oregon 86 byways. The Wallowa Terrane was the first accreted terrane to form Oregon, and consists of material from an island arc environment where an oceanic plate is subducting under another oceanic plate. Limestones, turbidites, and other such oceanic features are found in this terrane. Fossils of the Tethys Ocean between Laurasia and Gondwana from the Triassic and Jurassic now reside in Eastern Oregon, transported on the conveyor belts that are the oceanic crust. This terrane and others to the south and west are also intruded by stitching plutons. The Wallowa Mountains consist largely of granite of the Wallowa Batholith, one of the largest intrusive bodies in Oregon. The view from the town of Joseph shows Jurassic Martin Bridge Limestone overlain by granite of the Wallowa Batholith, then capped with CRBG. The chronological sequence represented in this view is limestone formation, terrane accretion, granite intrusion, uplift, and deposition of CRBG flow. Cutting through these formations are CRBG feeder dikes, and these dikes were the conduits which carried the massive flood basalts to the surface during the Miocene. The Wallowa Mountains also have interesting glacial features and deposits. Wallowa Lake near Joseph is dammed by a glacial moraine. Glacially deposited granite boulders are strewn about the surface. Miller then traveled to the opposite corner of the state to discuss US 199, which travels the boundary between the Paleozoic Triassic belt and the Western Klamath Belt in the Klamath mountains, which are formed by a series of accreted masses piled together. The different areas of the Klamaths have radically different compositions representing completely different formation environments. By example the Paleozoic Triassic belt consists largely of limestone while the Western Klamath belt is peridotite. Heading towards the coast and US 101, Miller described some features of the Franciscan Complex, the youngest of the Klamath accreted terranes. This rock originated in the accretionary wedge of a subduction zone. Rainbow Rock near Brookings features ribbon chert derived from a buildup of radiolaria. Most of the sea stacks at Bandon beach are sandstone, but some mudstone, chert, greenstone, and blueschist are present. Blueschist forms in the low temperature, high pressure environment of a subduction zone.